Welcome to the Motor City Region of The Cadillac & LaSalle Club! The CLC is an international organization of over 6,000 members with 18,000+ collectible Cadillac and LaSalle automobiles built by General Motors’ Cadillac Division. The club, founded in 1958 in Detroit, Michigan, provides activities and services for Cadillac enthusiasts. Ownership of a Cadillac or LaSalle automobile is not required for membership, just an appreciation for these works of automotive history. 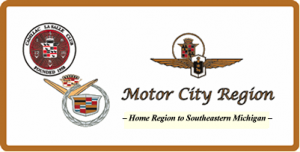 Also established in 1958, the Motor City Region began life as the St. Clair Region until the name was changed to the Motor City Region in 2004. The Region has approximately 120 members from all over greater Southeast Michigan Each month, members attend Region meetings, Burger Runs, other tours, events and activities enjoyed by all. If you are interested in meeting fellow Cadillac and LaSalle owners, we meet at the first Thursday of every month at various locations. For more information about our upcoming meeting and events, check the Events Listing on the right. Check back often for new content and features!